Sagres is the most westerly town of the Algarve and is a destination for visitors who appreciate nature’s raw beauty. The region is formed of massive cliffs and vast beaches, which are pounded by huge waves that roll in from the Atlantic Ocean. These powerful waves have drawn experienced surfers to Sagres, and this in turn has allowed the town to gain an unobtrusive, cool vibe. 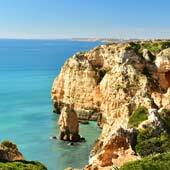 Sagres is small enough that it can be easily explored within a day and the relative closeness to Lagos makes it a popular day trip. Public transport is limited to Sagres but there is sufficient that a day trip is possible without the need of a rental car. This article will provide a detailed guide to visiting Sagres as a day trip from Lagos and includes sights and transport information. What are the main sights during a day trip to Sagres? 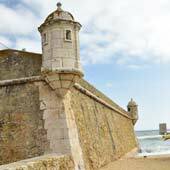 There are three main areas to visit in a day trip to Sagres; the Cabo de Sao Vicente, the fishing harbour & town and the Fortaleza de Sagres fort. The Cabo de Sao Vicente is the south-westerly tip of mainland Europe and is a wind-blasted headland, with huge cliffs that fall away to raging seas. At the top of the 75m high cliffs is one of Portugal’s most powerful lighthouses, which can be seen up to 50km out to sea. Generally, most people come to Cabo de Sao Vicente to admire the dramatic scenery and, unless an extended hike is planned, no visit to Cabo de Sao Vicente will be longer than 30 minutes. This length of visit conveniently aligns with the time the bus waits at the bus stop (see later in the article for details). The fishing harbour of Sagres is situated on the sheltered eastern side of the headland and throughout the day fishing boats returning to unload their cargos of fresh fish. 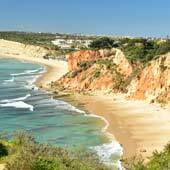 Over the headland from the harbour is the glorious beach of Praia da Mareta, a popular surfing beach or place to bask under the glorious weather of southern Portugal. The small town centre of Sagres has a ramshackle appearance but is quite in keeping with the unique vibe of the region. 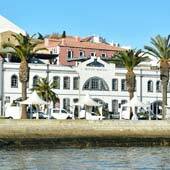 Found in the centre are laid back cafes and traditional Portuguese restaurants, ideal for an inexpensive lunch. The main tourist attraction of Sagres is the Fortaleza de Sagres (Sagres Fort). This fort is a unique defensive structure as there is only a single wall, with the other three sides protected by the sheer cliffs. The fort is vast but comparatively sparse, with a small chapel, a wind compass and spectacular views over the massive cliffs. Sagres and Cabo de Sao Vicente is not a destination for all, certain visitors may consider the region barren and devoid of sights, while other tourists will be captivated by the stunning and dramatic scenery. The sights of Sagres cover a large area so expect a lot of walking for a day trip. It is a 1km walk from the town and bus stop to the fort and once inside the coastal perimeter route is 1.5km. From the harbour to the Praia da Mareta beach it is again a 1km walk following the road or 2km via the beautiful coastal path. The region is buffeted by some very strong winds, be prepared for it to feel significantly cooler than in Lagos. Bring a good pair of walking shoes, as there are numerous rocky outcrops especially at Cabo de Sao Vicente. Portugal has a "if you’re stupid enough to do it, then live with the consequences" attitude; there are no safety barriers at the edge of the dangerous overhanging cliffs and there are precarious cliff-top paths which visitors should be wary of. A day trip to Sagres will be possibly one of the least expensive days spent in the Algarve. 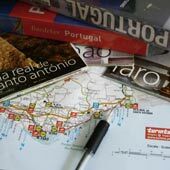 The only expenses will be the bus fare (about €9), the entrance fee to Sagres fort (€3.00) and lunch. Food and drink in Sagres is much cheaper than Lagos as it is more tailored to surfers or locals. Car parking is free in both Sagres and Cabo de Sao Vicente. If travelling by public transport it is advisable to visit Sagres on Monday to Friday as the bus to Cabo de Sao Vicente does not operate at the weekend (or on public holidays). Sagres is pounded by massive waves; the cliffs in the background are 40m high! 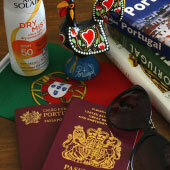 The length of the day trip to Sagres will depend on the amount of time spent walking or relaxing on the beaches. Cabo de Sao Vicente can be fully seen in 30 minutes, and the fort takes about 40 minutes to explore. Sagres is 30km to the west of Lagos and, depending on the bus service, takes between 40-60 minutes. A single bus ticket from Lagos to Sagres costs €2.85, a ticket from Lagos to Cabo de Sao Vicente costs €4.20 and a ticket from Sagres to Cabo de Sao Vicente is €2.00. 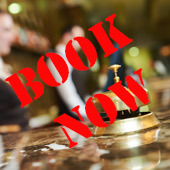 There are no return tickets and the ticket is purchased from the bus driver, expect in Lagos where the ticket must be purchased from the ticket office. In Sagres, the bus stop is outside the tourist information, close to the fishing harbour. The return bus to Lagos departs from the opposite side to the tourist information centre. While at Cabo de Sao Vicente be aware of the time, as the bus gives no indication that it is about to depart (eg no toot of the horn). Also, if the bus is delayed reaching Cabo de Sao Vicente it will spend less time there so that it can depart on time. What are the best sights and activities in Lagos?